Watch the latest live stream in full. Nintendo of Japan hosted a Xenoblade Chronicles X live stream detailing the game’s combat elements this morning. 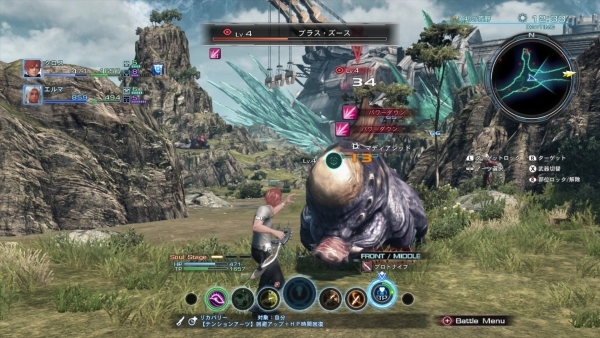 The Monolith Soft-developed open-world action RPG is due out for Wii U in Japan on April 29 and later this year in North America and Europe. Find our summary and the 30-minute video below. Find your target, draw your blade, and the begin the battle. For basic combat, you have weapons like swords and knives for close combat, and rifles for long range combat. Smart switching between weapon types coupled with good timing will result in the battle proceeding automatically. Your Arts (special abilities) are lined up at the bottom of the screen, and can be freely organized to your liking. In addition to “Fighting Arts” and “Shooting Arts,” there are also “Recovery Arts” to support your allies and “Weakening Arts” to inflict ailments on enemies. Arts require a cooldown period before they can be recast. You’ll talk with your allies as you fight. Your allies will call out to you, resulting in an Art getting lit up, indicating which should be cast next. “Soul Voice” is then triggered by casting that Art and responding to them in kind, resulting in various potential effects such as buffed Arts. The party’s HP is also healed at this stage. Sometimes a circle will appear in the center of the screen during battle. If you quickly press the B button, the player can essentially trigger Soul Voice themselves in reverse order. Soul Voice types can be manually set outside battle, and there are various types of Soul Voices with a number of effects. Attack Arts + Attack Arts – Combining Attack Arts give them a greater effect. Stringing either a Fighting Art or a Shooting Art after an Attack Art, for instance, can result in increased damage, making it important to memorize which combos are possible to pull off. Collapse + Tumble – If after using an Art the enemy collapses and players then proceed to use another Art with a tumble effect, they can make the enemy fall onto the ground. Not only will this seal off their attacks, but they’ll take 1.5 times damage during this state. Attacking an enemy from certain positions, such as their backside or from higher or lower terrain, can influence accuracy and critical hit chances, making them potentially go up. This also applies to Arts, whereby positioning can bolster their effectiveness. Enemies will have different parts you can target and attack. If you manage to destroy that part, you’ll get a reward that normally can not be obtained. After using an Art, you’ll need to wait before it can be used again. Howvever, if you continue attacking with auto-attack following the cast, the Art will refill and enable a Double Recast, which has a greater effect than regular Arts. As you auto-attack, your Tension will raise. If your Tension is accumulated enough when an ally falls, you’ll be able to revive them. A big battle element. When you activate your Overclocking Gear, your recast time is greatly shortened, so you can perform Arts one after the other. Doing so will also let you achieve a “Triple Recast,” which is even stronger than a Double Recast. When you trigger your Overclocking Gear at the same time as your allies, the effects are greater. The Overclocking Gear will not be available from the beginning of the game. Icons that appear on screen will indicate whether an enemy, for instance, will trigger fights by sight or by sound or even if they’re prone to intervening and joining the battle in an ongoing fight. Each weapon and armor offers its own attributes and enhancements. You can equip one close range and shooting weapon each. Close range weapons consist of knives, swords, shields, and javelins, while shooting weapons consist of rifles, guns, launchers, and such. As for armor, you’ll be able to equip to your head, torso, right arm, left arm, and legs. Various enterprises within the Arms Company develops equipment, with each enterprise producing goods that have strengths and weaknesses in different areas. Utilizing different equipment out on the field is subsequently used as a form of advertisement in the game. If a commercial effect is in place, that means players will have an enterprise’s official support, which in turn is connected to the production of new equipment. Basically, battling more and more with a particular brand will help the corresponding enterprise grow. New enterprises will also appear over time, widening the scope of potential equipment to use. Some equipment also have slots, which can be filled with things like devices that can provide buffs and add special abilities to them. In addition to shops, equipment can also be procured sometimes by defeating enemies, with some weapons having especially wild weapon drops. Your Inner Level and Class Rank represent your character’s strength. If you have a low Inner Level, high tier equipment can’t be equipped. Your Inner Level rises not only through combat, but also by discovering treasure boxes on the field, as well as unexplored locations. Your class makes up your battle style. An initial class is used to build up proficiency, with players eventually able to change out into the next class. Class types affect what Arts can be learned, as well as what weapons and abilities a character is proficient in. The higher up the class ladder you go, the more specialized arts and abilities you’ll pick up as you refine your overall combat style. Blade members can team up together for a party of up to four made up of people living in New Los Angeles.